Pizza-eating teenage Turtles? Strange concept. Pizza-eating teenage Turtles dressed up for Halloween? Stranger concept. 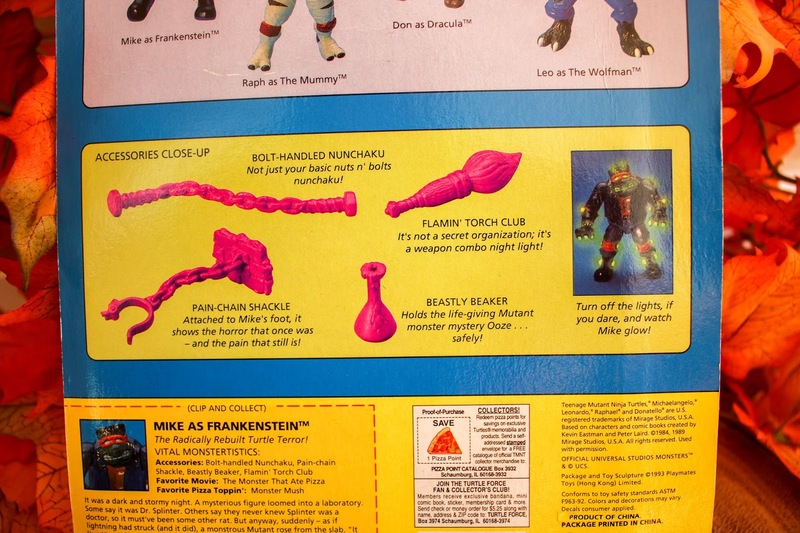 TMNT has had many crossovers since their early days in the 80s. The fun-loving mutants and their brand of zany hijinks make mashing up with other franchises an obvious opportunity. From stupid silly to completely cool, the Heroes in a Half Shell have donned many looks, borrowing from many pop culture characters. Star Trek, WWE, Trolls, and now Ghostbusters - there weren't, and still aren't, any limits to the looniness of TMNT crossovers. 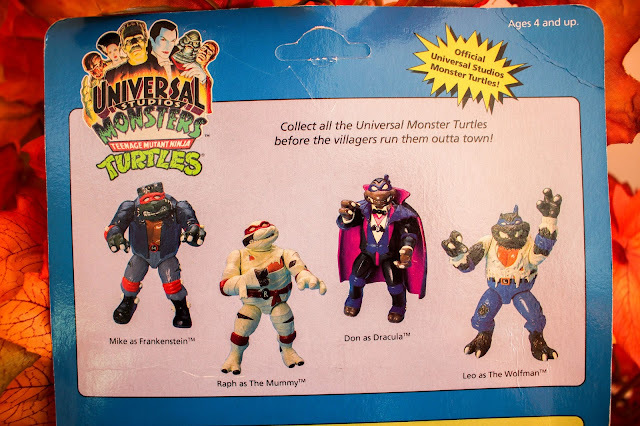 My favorite, and a favorite to all Halloween fiends, is the TMNT x Universal Monsters crossover. 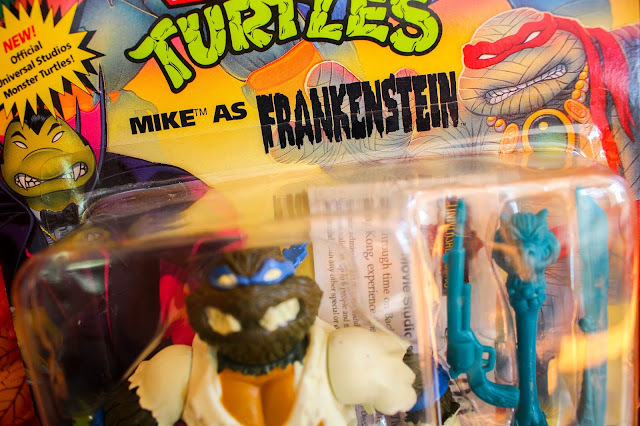 This wave of toys saw the Turtles mash up'd with classic movie monsters. We're talking the big players in horror history, every freak from Frankenstein to the Invisible Man. This batch of weirdos was a long time much-sought-after Holy Grail for me. There were 2 waves of figures, 4 in each, and I only had one of the 8 figures while growing up (Creature from the Black Lagoon Leo). Bless the sewer gods, I successfully scooped up a complete set years ago for a decent price - before TMNT toy prices went off the rails. I am engaged, own a house, and even directed 98-minute feature film, but this purchase still might've been the best thing I've ever done. Although these dudes aren't new to my collection, something wicked recently joined The Sewer Den ranks. A new addition to the crazed collection of oddities. 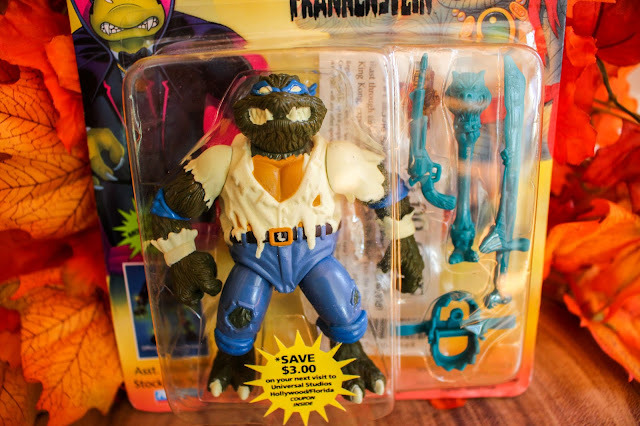 A friend hooked me up with another TMNT x Universal Monsters figure. It's still in its original packaging too, something not too common in my collection. But this isn't just any piece of plastic. It possesses a special Halloween spirit unlike any other. Can you spot the hocus pocus? Boo! The packaging plays a Halloween-like trick on you. 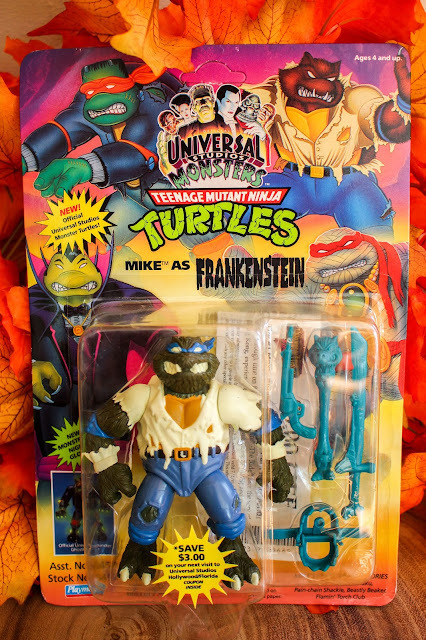 Leonardo as The Wolfman is the figure, but the packaging belongs to Mike as Frankenstein. It's one of those weird errors that excites a handful of collectors. I have no interest in misprints or the collectibility of rare packaging, but I do enjoy this particular screw up. The TMNT x Universal Monsters line was destined for an oddball quirk. In the Halloween season, we've gotta celebrate the strange! Michelangelo fans rejoice! The error carries to the back of the package too. Leonardo's bio and arsenal of weapons is MIA. 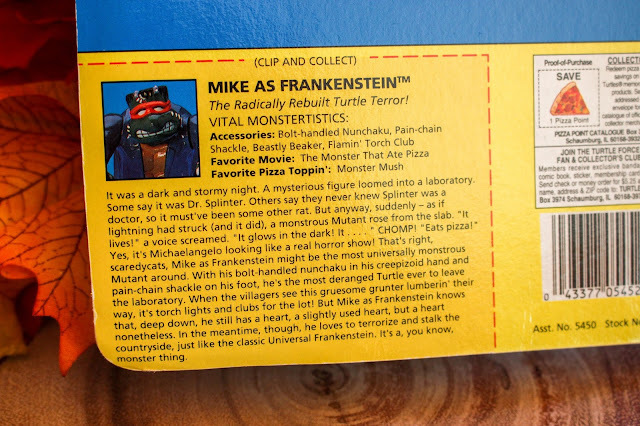 Again, Mike as Frankenstein gets the spooky spotlight. No matter which Turtle is displayed, it's comforting to know there's always a Pizza Point with the figures from the 90s. My kid-like passion to open toys hasn't changed since those days of childhood. Normally, I'd (gently) tear apart the package to release Leo as The Wolfman from his paper and plastic prison. But with this wacky one, the packaging IS the highlight. Leo will likely stay inside his personal haunted house for another twenty years. All trick and no treat for this dude! The packaging is incredible on these. Like a complete moron I traded off my Black Lagoon Leo a while back, regrets. Sewer tears! That is a sad story. Although, we've all made a bad toy decision at least once.